Hannah writes: Chinook is an awesome dog. She is being trained in Agility and literally zooms through the course. Chinook has a friendly, willing to please attitude that is just endearing. One of my favorite things about Chinook though is that no matter what she is doing when I call her name she will come. It does not matter if she is playing with other dogs or just running free. She will still come. Even if I don’t call she will come over from time to time just to check up on me. She is a fabulous dog and a joy to train. 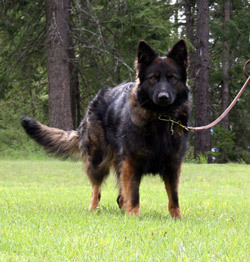 July 18, 2009– Chinook earned her ASCA Junior Jumpers Novice Agility Title. Chinook also has legs earned in AKC AGILITY, and ASCA AGILITY Regulars. One judge commented that it is so nice to see German Shepherds with the correct structure for jumping.